The 1975, Post Malone and Foo Fighters are set to headline Reading and Leeds next summer. The mammoth twin-site event returns in 2019, with the first names for the incoming instalment being unveiled. The 1975 release their new album in a matter of days, and with another LP mooted for 2019 it's set to be an important 12 months for the band. The group will headline Reading and Leeds next summer, bringing their bold, brash live show to the next level. Foo Fighters will return as headliners, while Post Malone will be joint headliner alongside Twenty One Pilots. Other names on the bill include Pale Waves, The Amazons, Bastille, Sundara Karma, Not3s, Blossoms, Billie Eilish, and more. Tickets go on sale this Friday (November 23rd) at 9am. 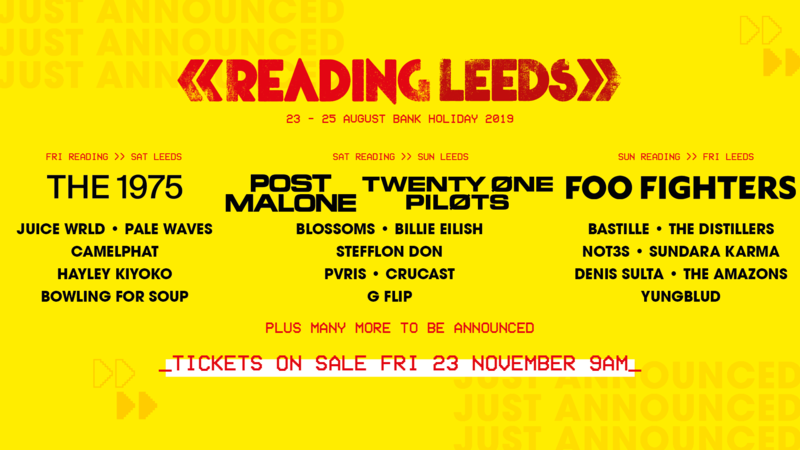 Reading and Leeds runs between August 23rd - 25th.